Luka Modrić (born 9 September 1985) is a Croatian footballer who plays for Real Madrid and the Croatia national football team. 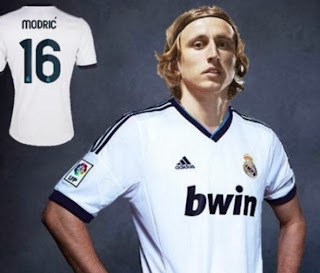 Modrić plays mainly as a central midfielder, but can also play as an attacking midfielder and winger. After showing promise in hometown club Zadar's youth team, he was signed by Dinamo Zagreb as a teenager in 2002. His professional career began with loan spells at Zrinjski Mostar and Inter Zaprešić. While he was playing for GNK Dinamo Zagreb, they won three consecutive league titles and several domestic cups, with Modrić named Prva HNL "Player of the Year" in 2007. In 2008, he moved to Tottenham Hotspur in England's Premier League, before moving to Real Madrid in the summer of 2012. Modrić is a Croatian international and made his debut against Argentina in March 2006. He has since participated in three major tournaments; 2006 FIFA World Cup, and UEFA Euro 2008 and 2012. He scored his first international goal in the friendly match against Italy, and at the Euro 2008 was included in the UEFA "Team of the Tournament", becoming only the second Croatian to ever achieve this honour. On 27 August 2012, Real Madrid announced that they had agreed a deal with Tottenham for a fee in the region of £33 million. Modrić signed a five-year contract with the Spanish club. Two days later, he made his Real Madrid debut against FC Barcelona in the second leg final of the 2012 Supercopa de España at the Estadio Santiago Bernabéu, replacing Mesut Özil in the 83rd minute. Madrid eventually won the game, giving Modrić his first trophy with the club just 36 hours after his signing was announced. Despite his positive debut, Modrić initially struggled to settle into the team under manager José Mourinho due to his lack of pre-season training which he missed as a result of his ongoing transfer negotiations. The presence of veteran midfielder, Xabi Alonso, usually kept him out of the starting lineup, limiting him to substitute appearances and mostly playing out of position for the first few months at the club.